It is easy for those who have not studied the war for themselves to say it was just about slavery. However, students of the war know it is far more complicated than that. It was about the economy of slavery. True, had there not been slavery, there may not have been a war. Had there been modern farm machinery there would not have been a need for slaves. But this was a primitive time. The entire country, both North and South, participated wholly in the slave economy. Had it not been for the cotton exports after the Revolutionary War, America could have well been a third world country. Cotton was the cash cow, and it was labor intensive. America was producing 3/4 of the world’s cotton. Cotton was the only commodity ever given a name by Wall Street—King Cotton. Cotton was the single largest export and NYC was the financial capital of the vital product. Northern slave ships brought the slaves to our shores with great profits for Rhode Island investors. Connecticut insurance companies insured the plantations. The countries greatest asset was the four million enslaved African Americans with a value then of $3.5 billion producing 4.5 million bales of cotton. There just simply were not enough people living in the country at this time to keep up with the demand for this time consuming product called cotton. In the South, 25% of the population were slave owners—leaving 75% who were not. However, 100% of the households were affected by the war. This is the story we should be telling and not erasing. There is plenty of blame and shame to go around, but there is also much pride and grit too. 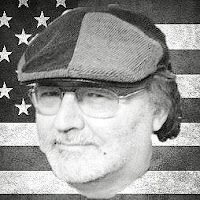 Together, through the good and despite the bad, people in the North and South, both slave and free, along with immigrants and Native Americans, created the best nation on earth. There is room for all to be proud together that our ancestors did this for us. 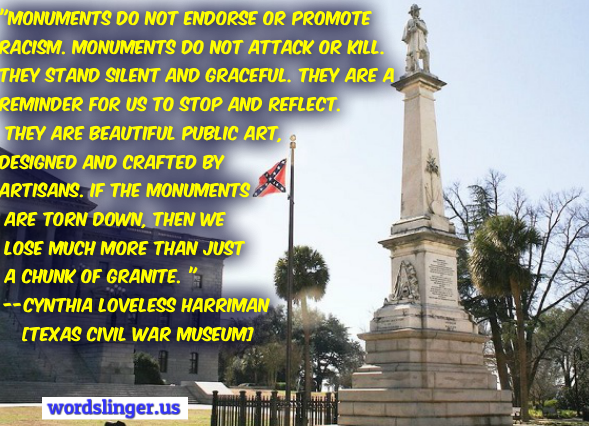 Monuments do not endorse or promote racism. Monuments do not attack or kill. They stand silent and graceful. They are a reminder for us to stop and reflect. They are beautiful public art, designed and crafted by artisans. If the monuments are torn down, then we lose much more than just a chunk of granite.